We’ve all seen the wedding reception slide show featuring the happy couple growing up through childhood, dating, and then finally becoming permanently intertwined in each other’s lives. You can imagine how long it took an intrepid soul to build that production. But if you've used the Faces feature in iPhoto ’09 to identify the people in your photos, you can produce the same heartwarming tribute in just a few minutes. Step 1 Create a smart album (File -> New Smart Album) that uses two "Face Is" conditions to find all images of each person in your library. You will get a rich stockpile of pictures to choose from. 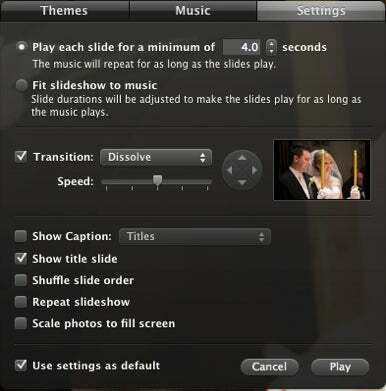 Step 2 Set up your default slide-show settings. The easiest way to do this is to select a handful of pictures (they can be any pictures) and click on the Slideshow button at the bottom of iPhoto. In the resulting dialog box, use the Theme, Music, and Settings tabs to set transitions, music, and so on. Once you get everything set up to your liking, check the box next to Use Settings As Default. Set you your default settings ahead of time to save time. Step 3 Return to your wedding smart album and choose the images you want in your presentation. I recommend sorting the images by date in ascending order (View -> Sort Photos). This puts the oldest photo at the top of the heap, and the newest at the end—perfect for telling the life story of the newlyweds. Select the images by holding down the Command key and clicking on each desired thumbnail. Step 4 Once you have all the desired images selected, go to File -> Export, and click on the Slideshow tab. Choose your size, click on Export, and iPhoto will build the slide show according to your default settings. You can play the final product in either QuickTime or iTunes.